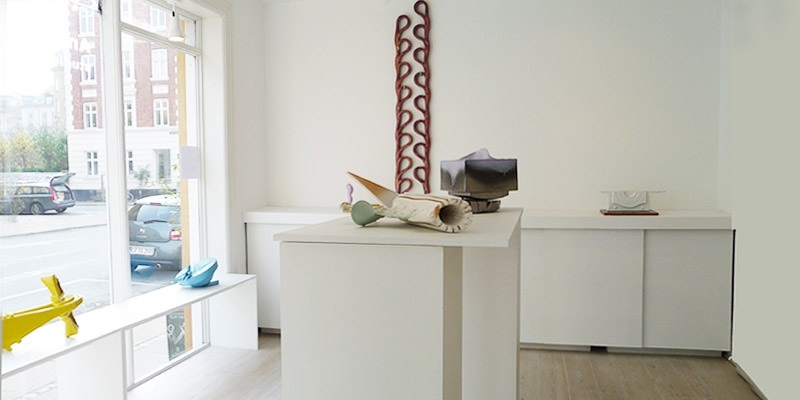 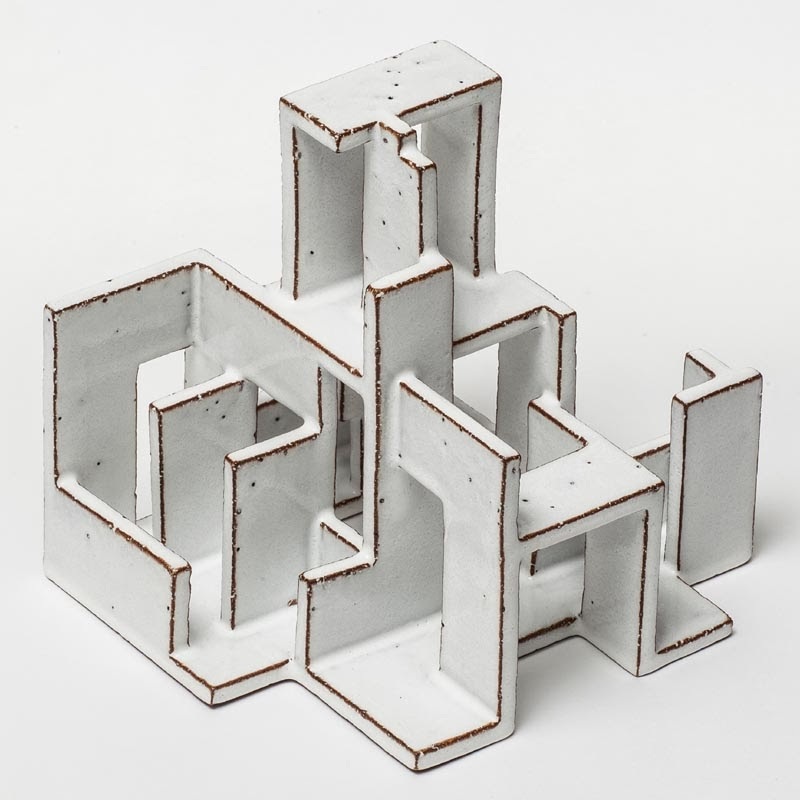 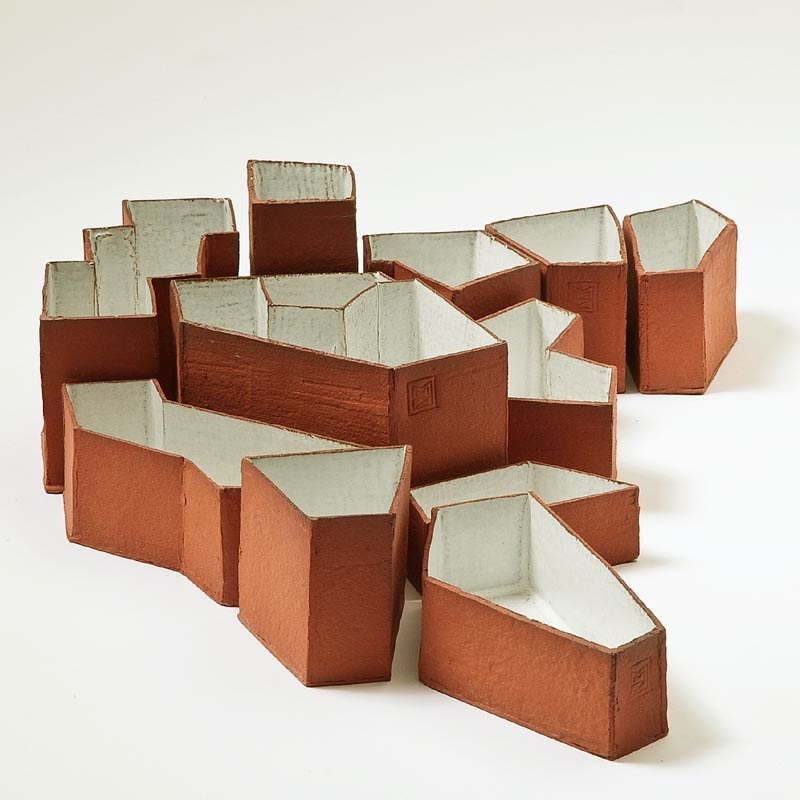 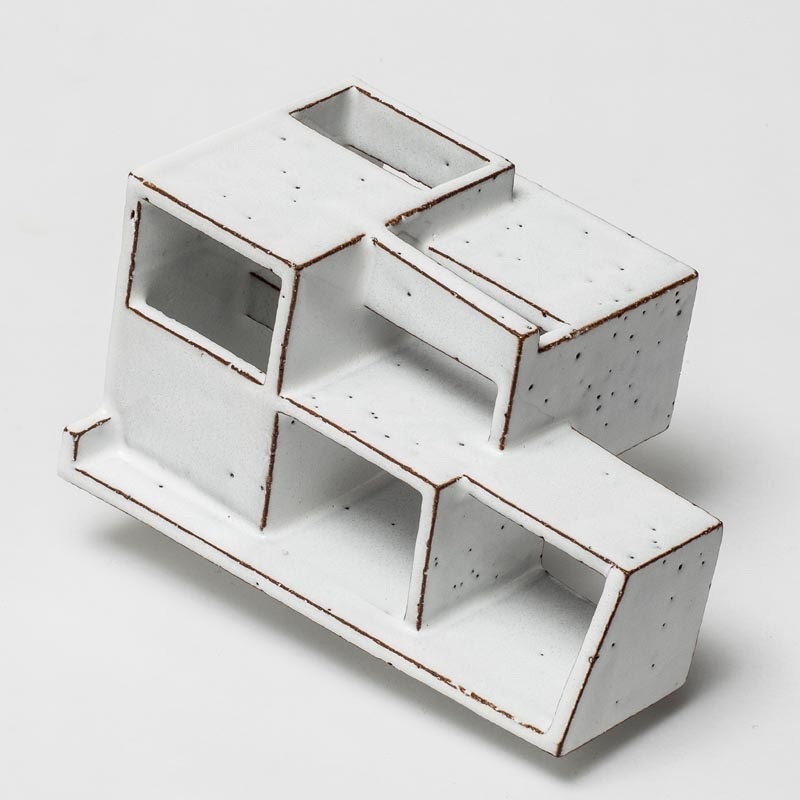 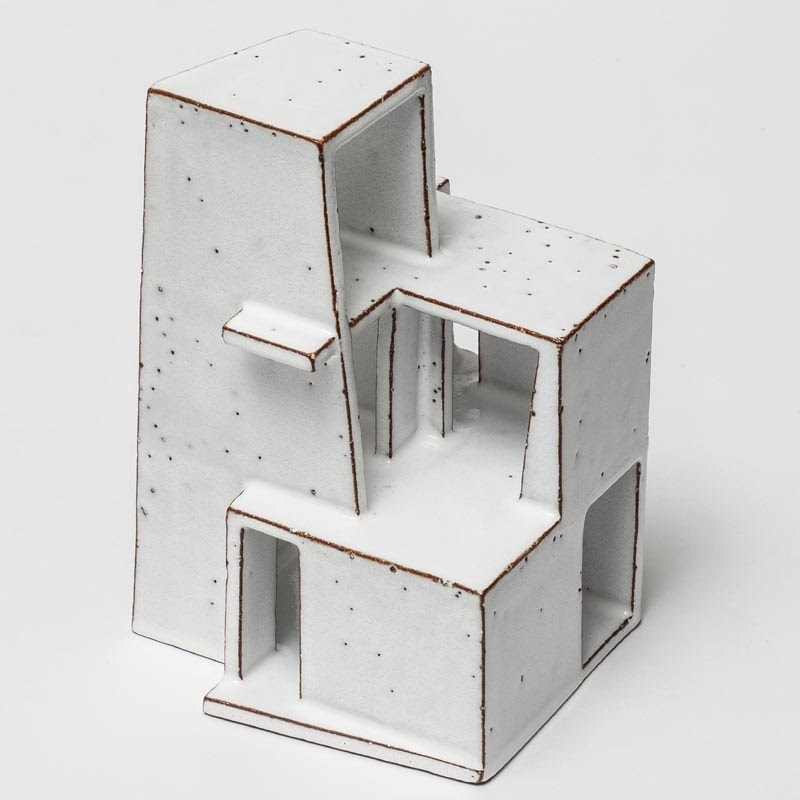 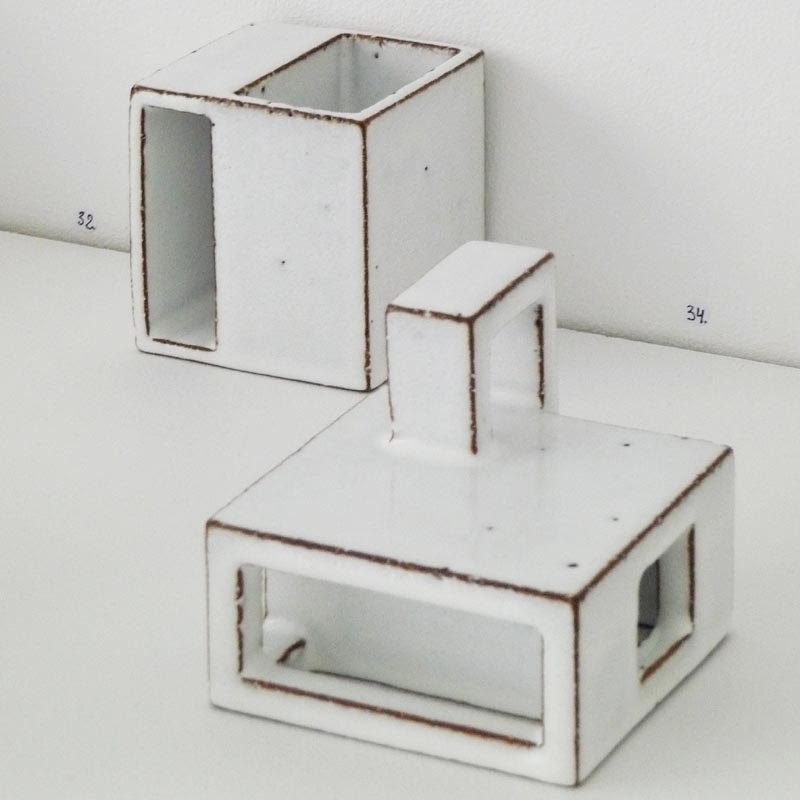 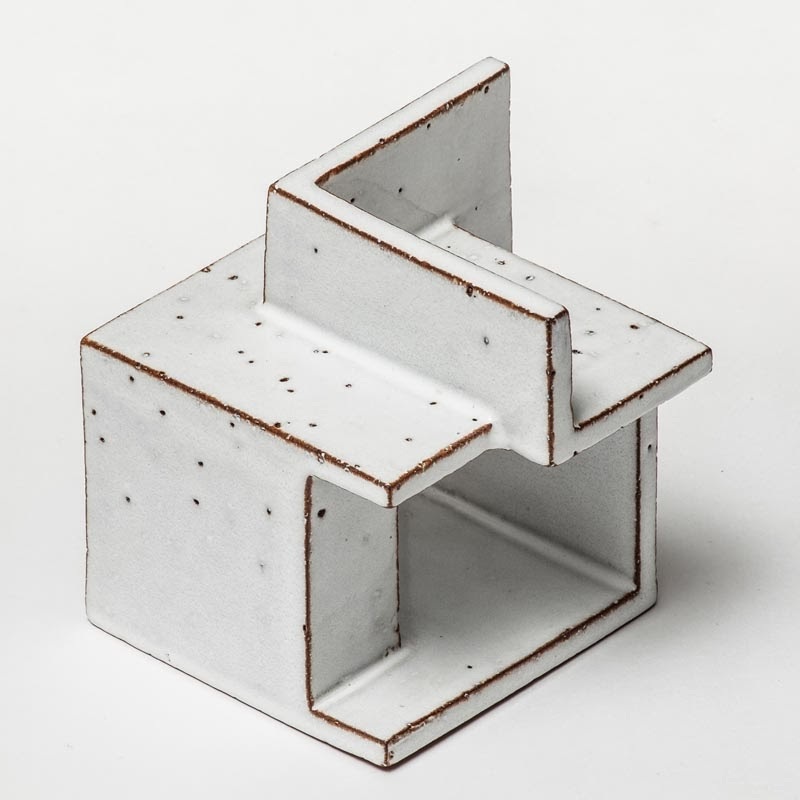 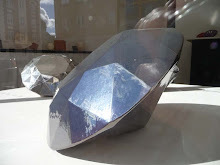 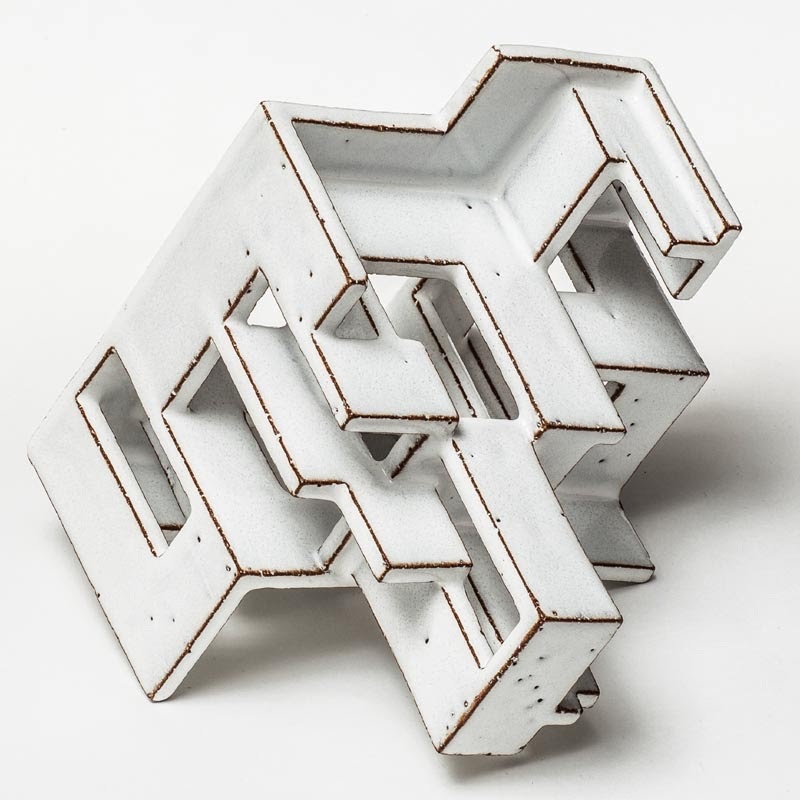 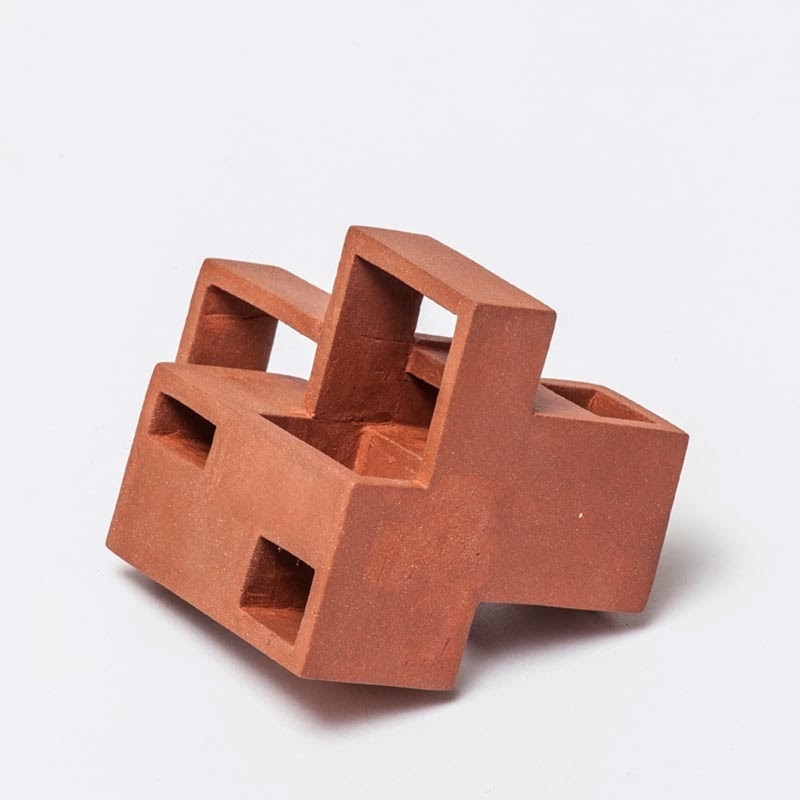 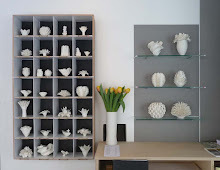 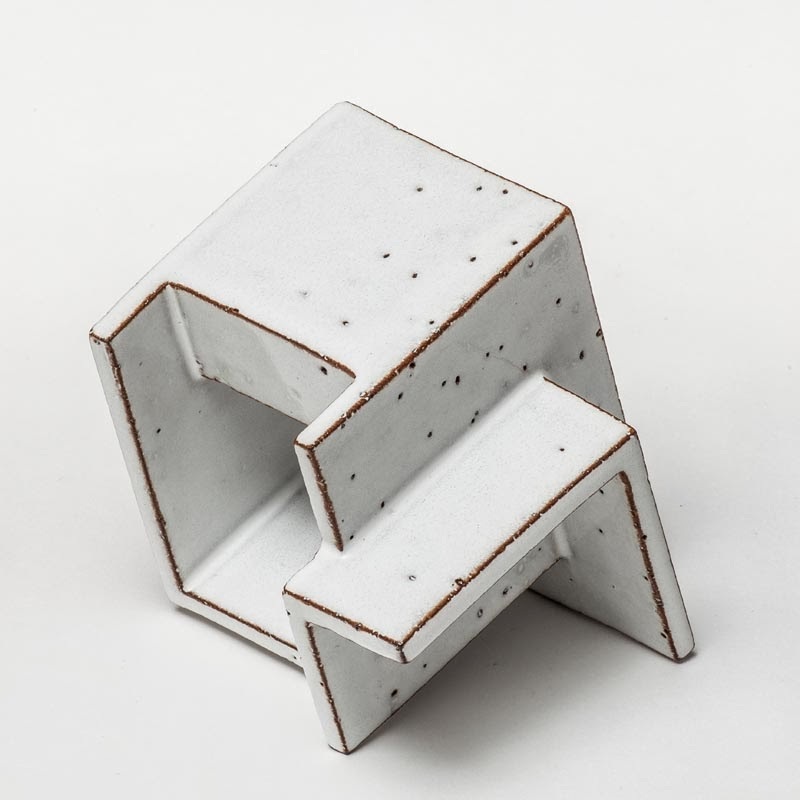 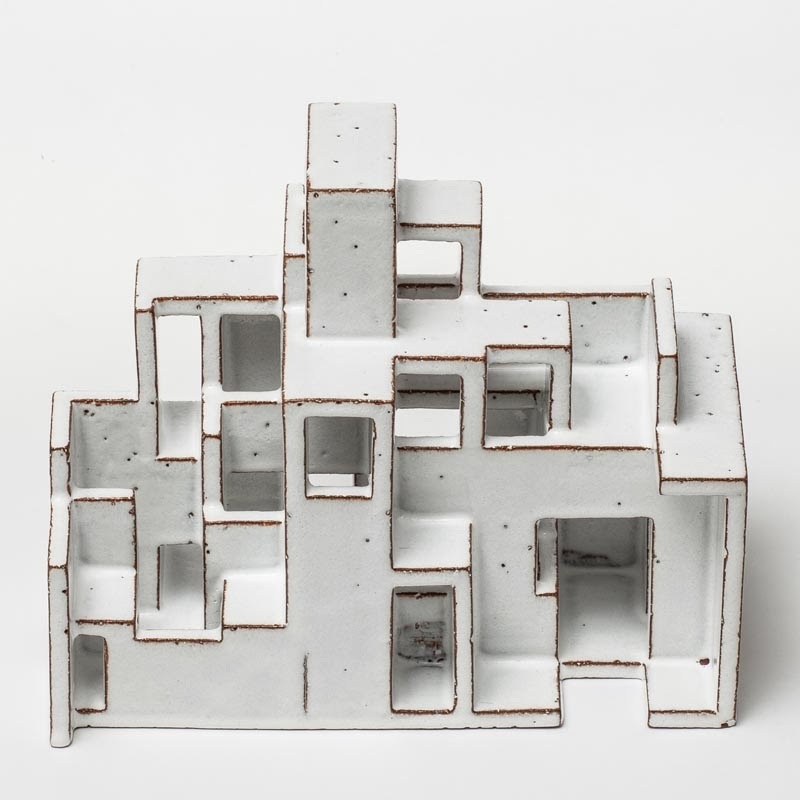 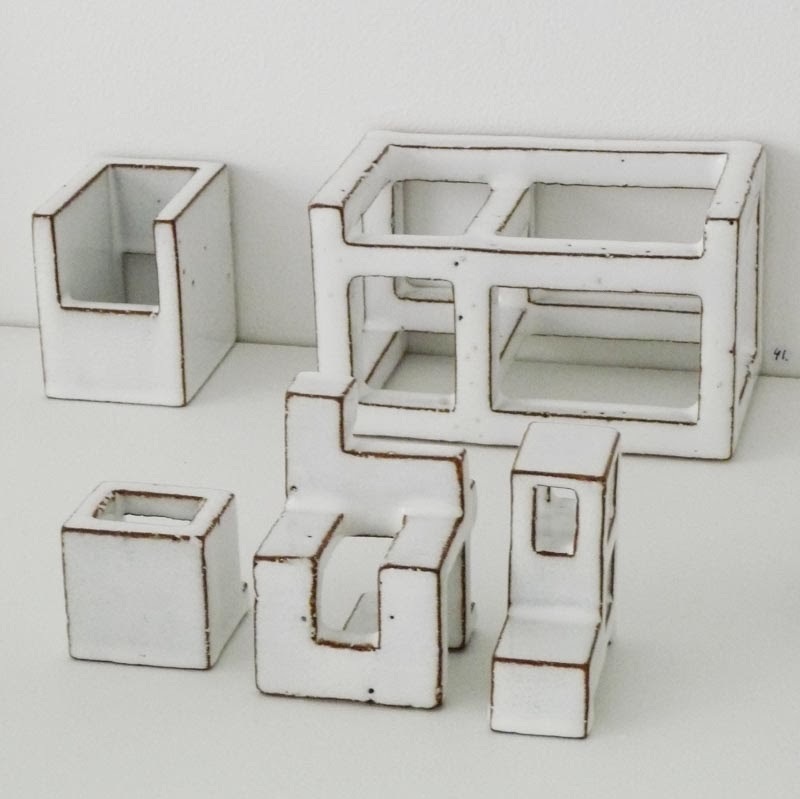 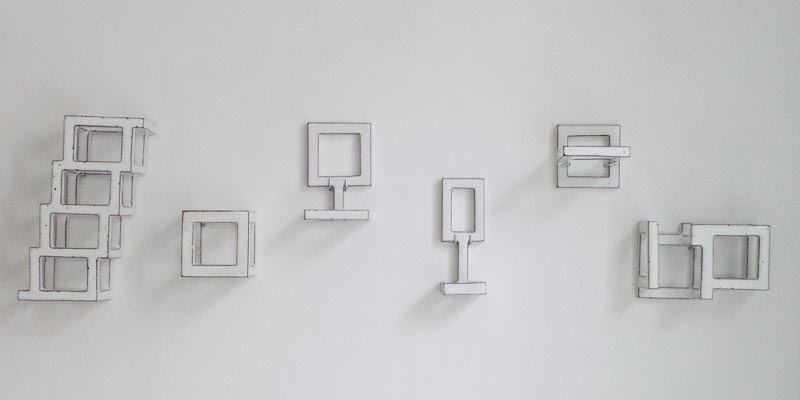 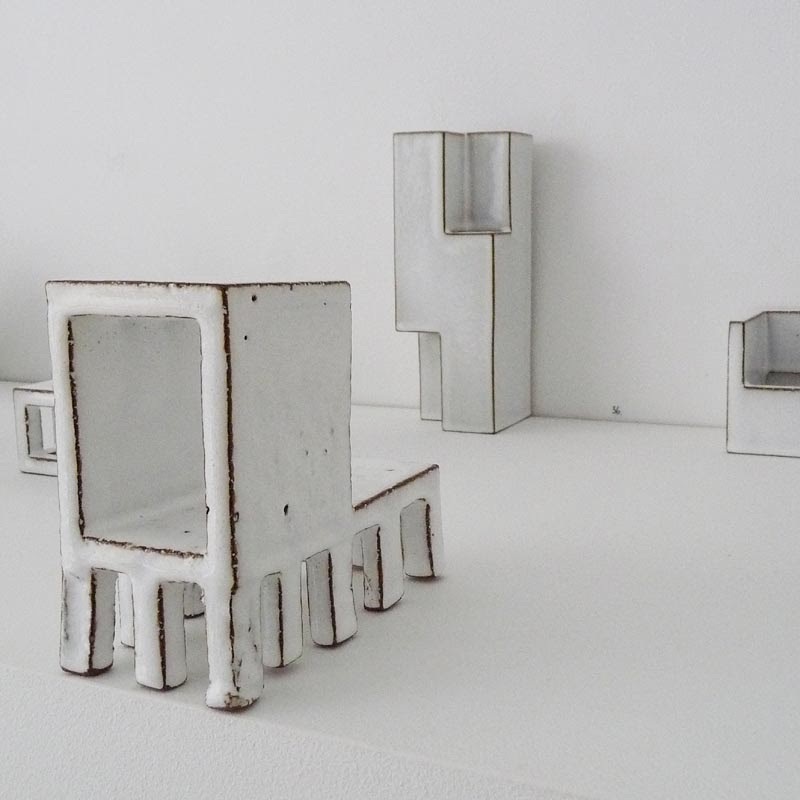 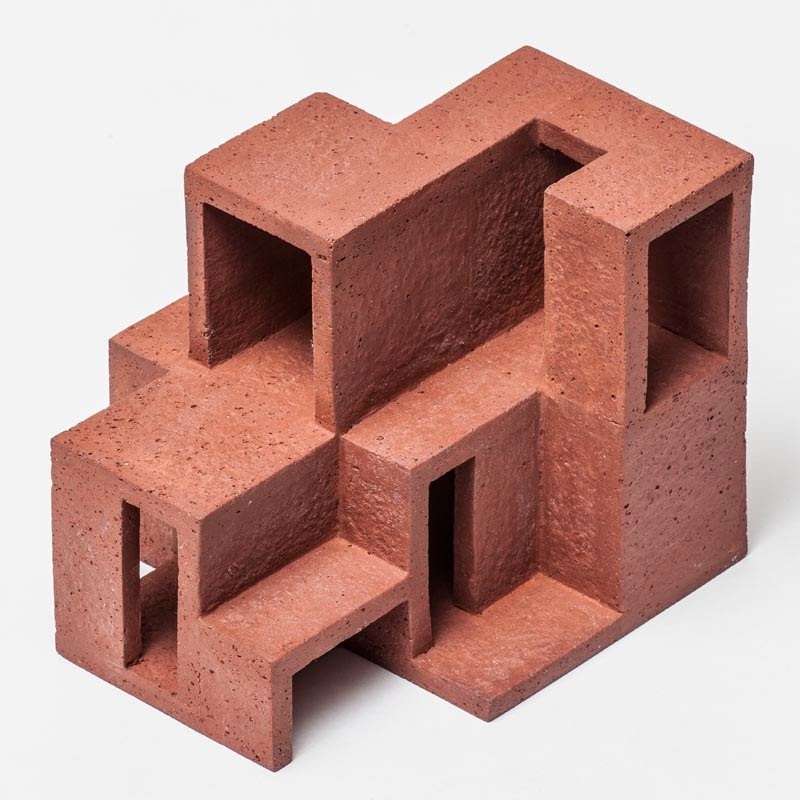 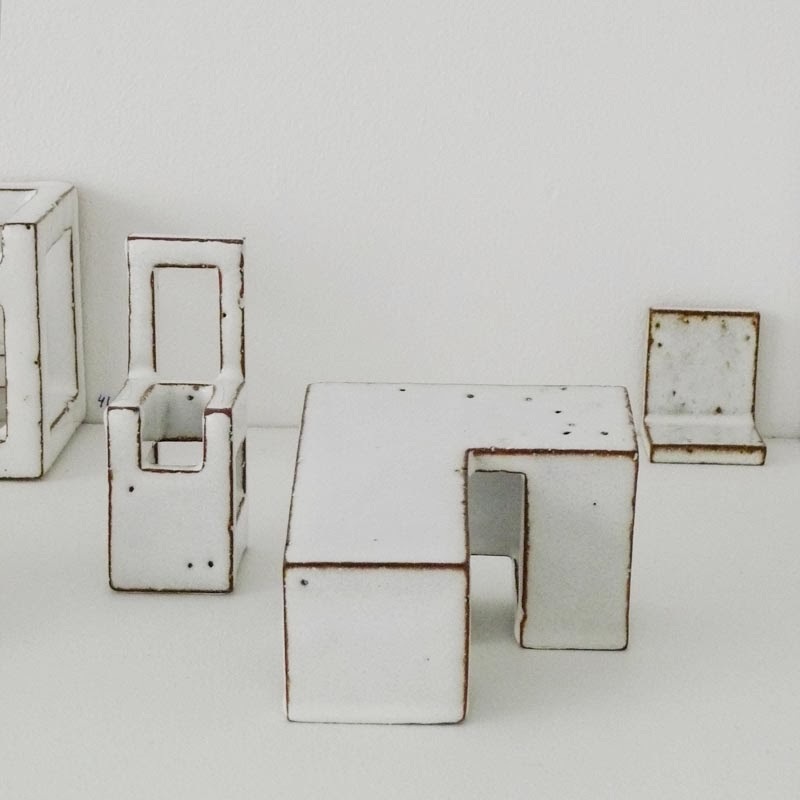 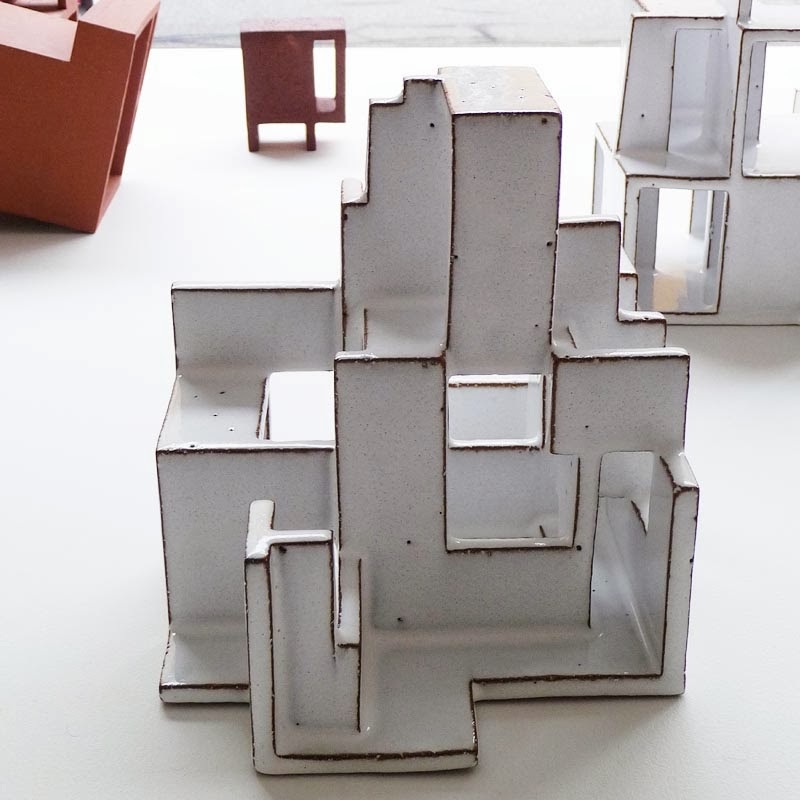 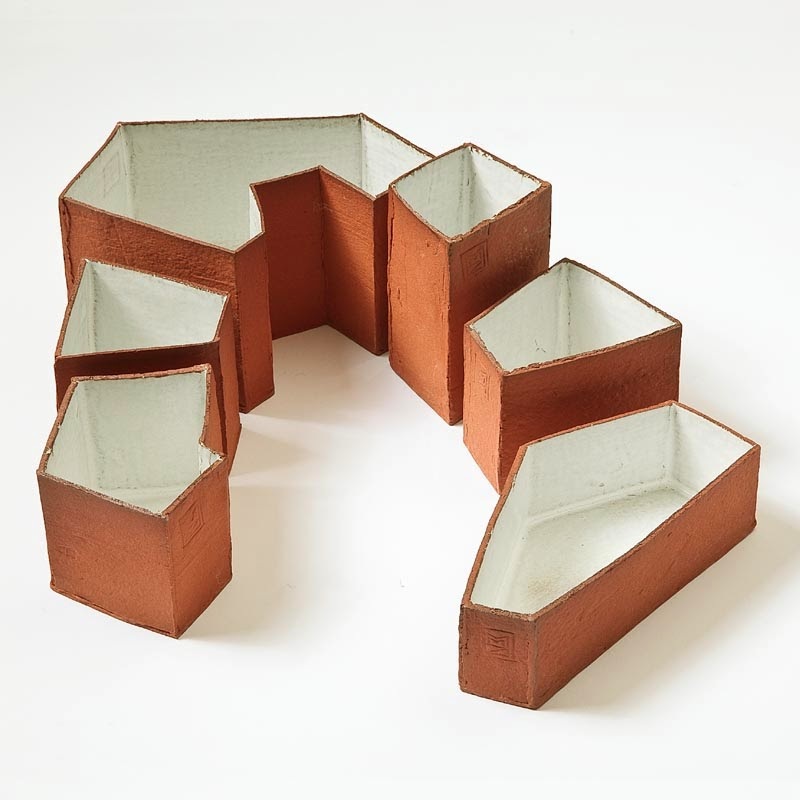 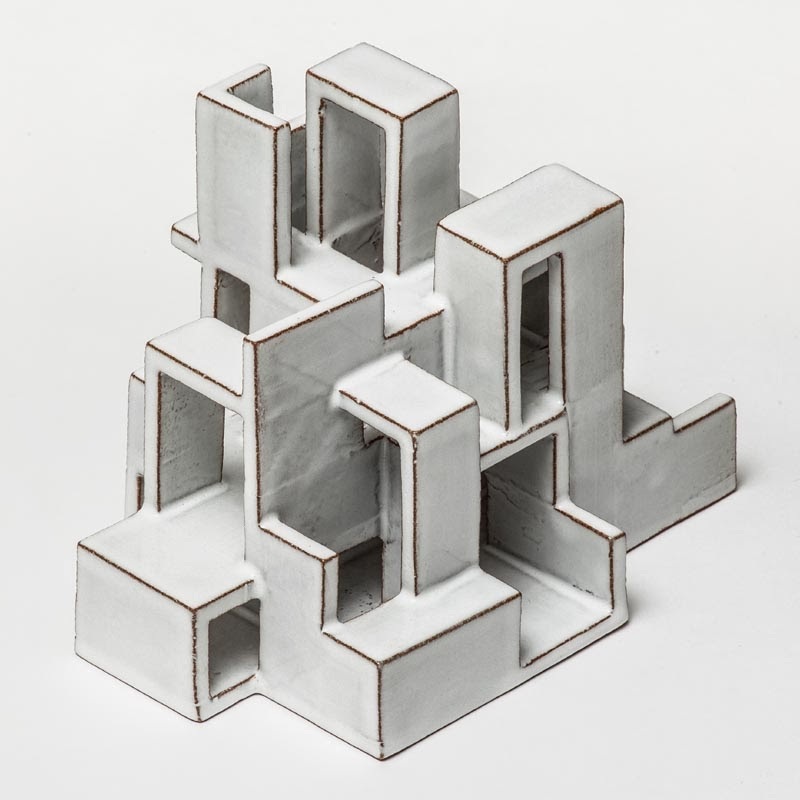 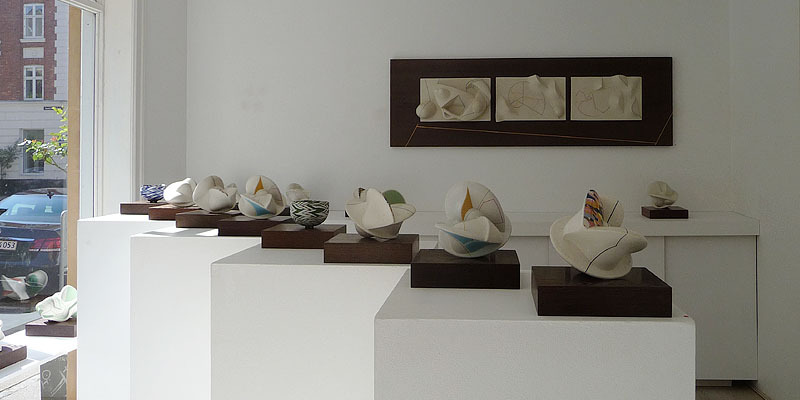 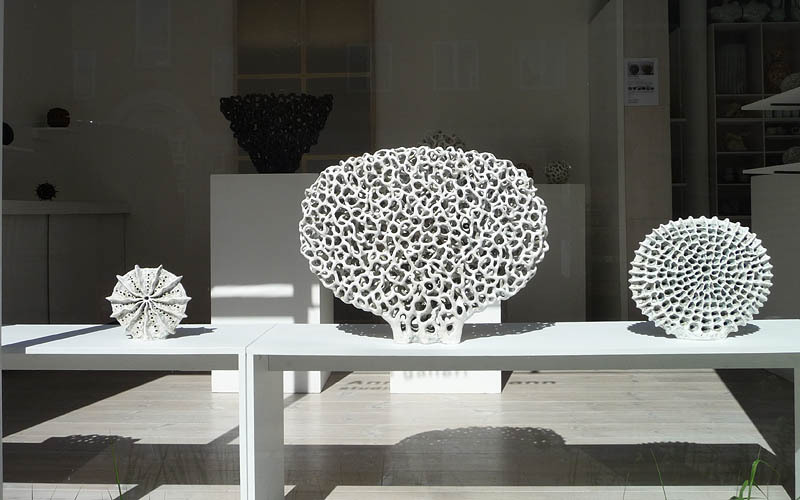 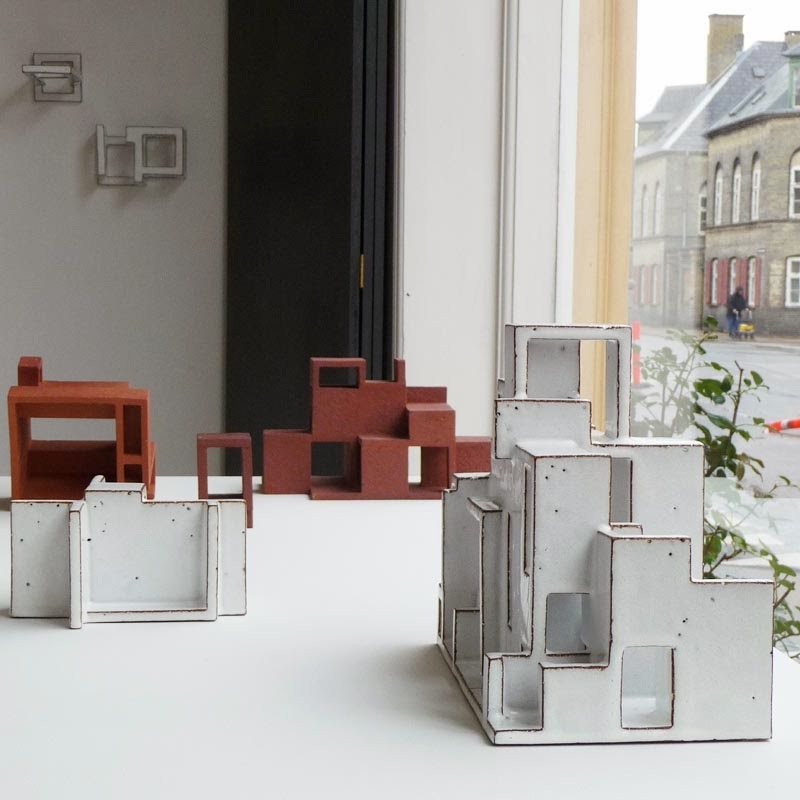 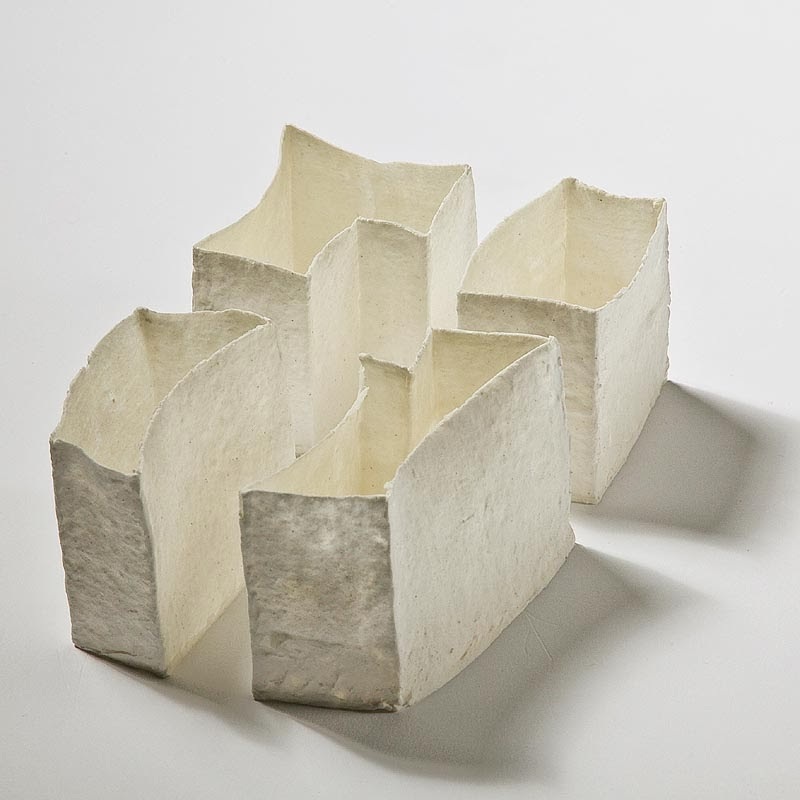 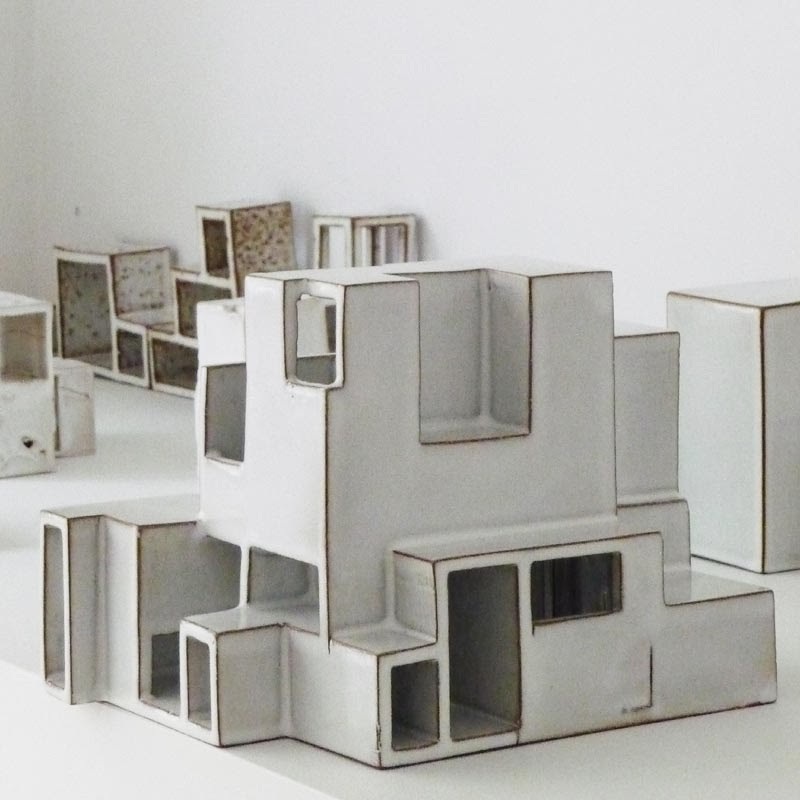 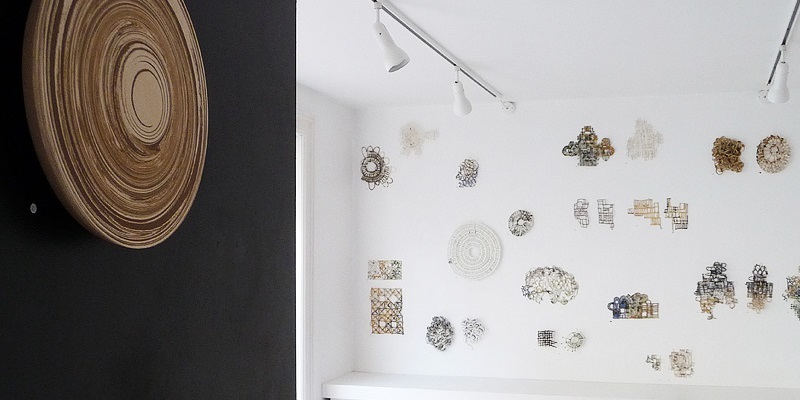 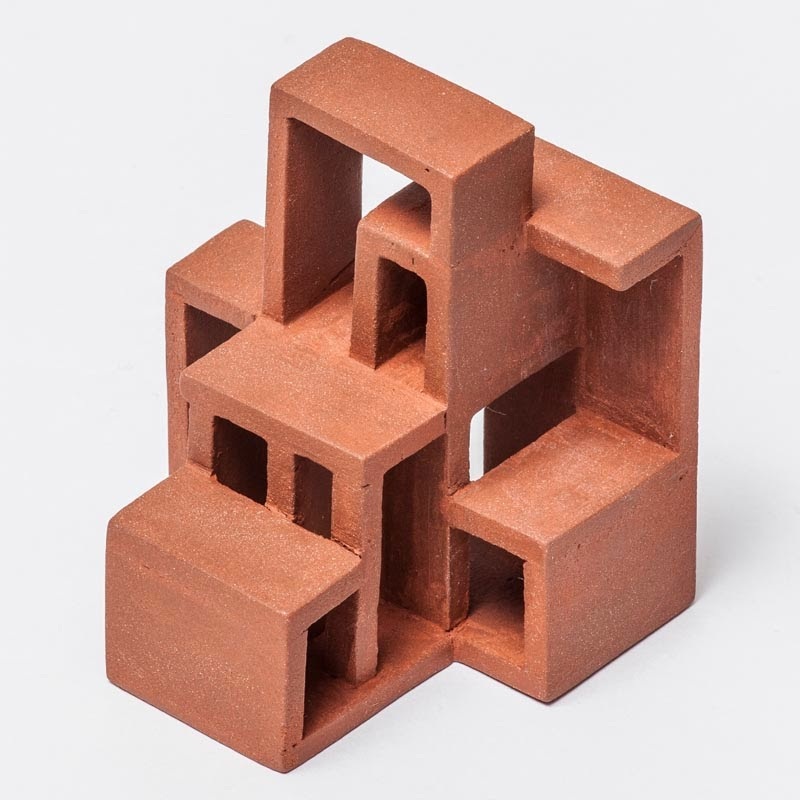 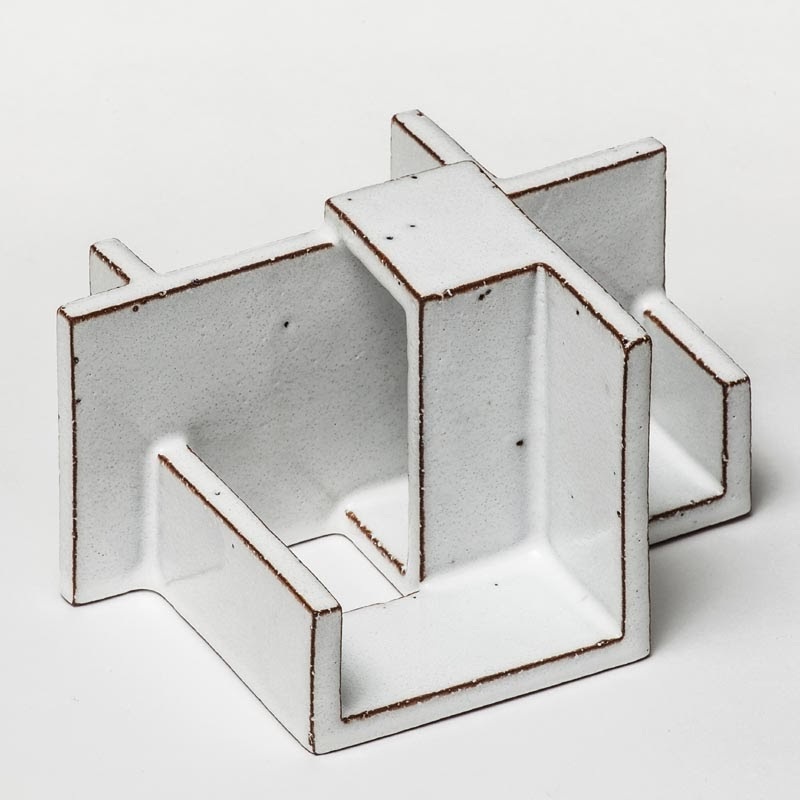 Abstract visions concreted in a tangible material..
Mette-Marie Ørsted works with geometry, card houses, cultural cities in her Ceramic Concretions, which are as cut out with scissors, out and assembled, clearly grown out from the 2D flat to 3D form. 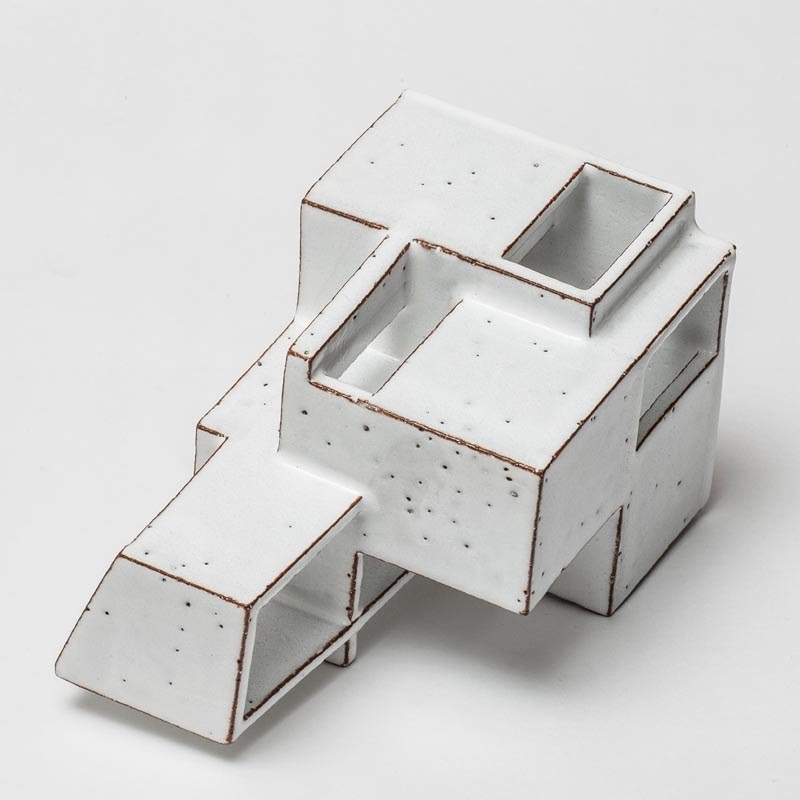 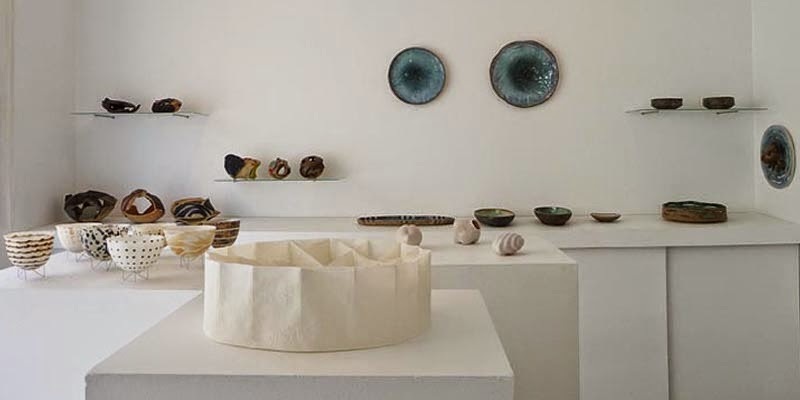 She explores the architectural space interacting with the ceramic spacious, the raw clay versus the glazed surface, the poetic narrative towards pure geometric form. 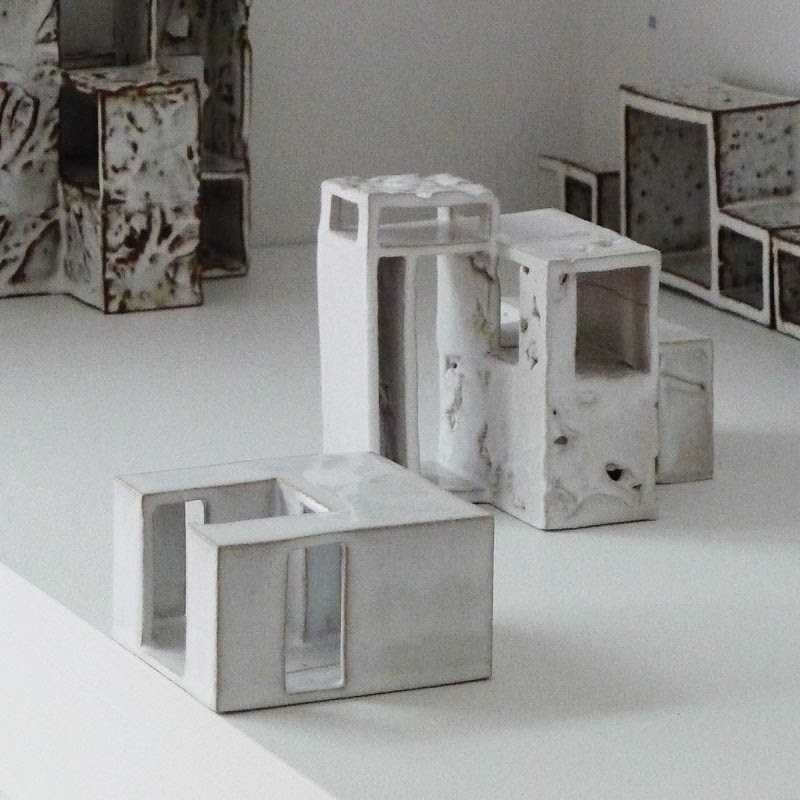 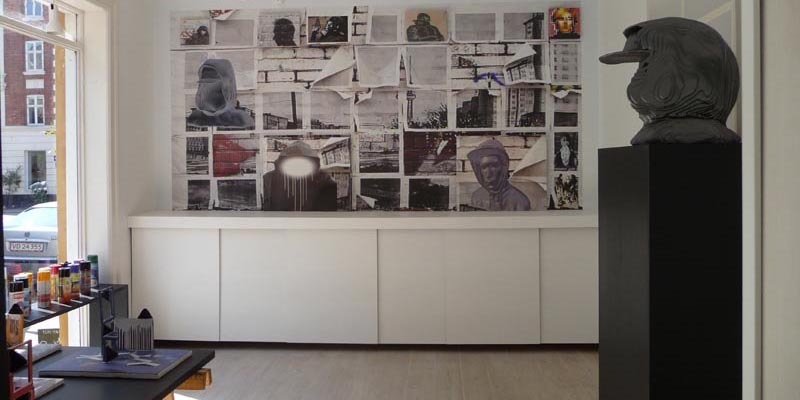 She refers to cultural experience, urban communities and ways of living - abstracts concreted in a tangible material. 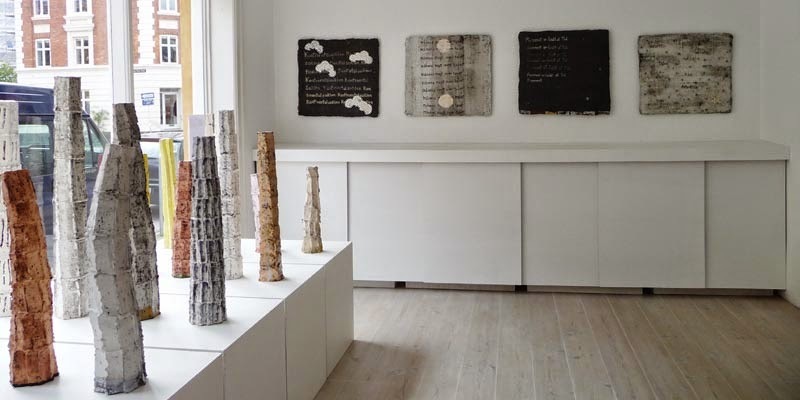 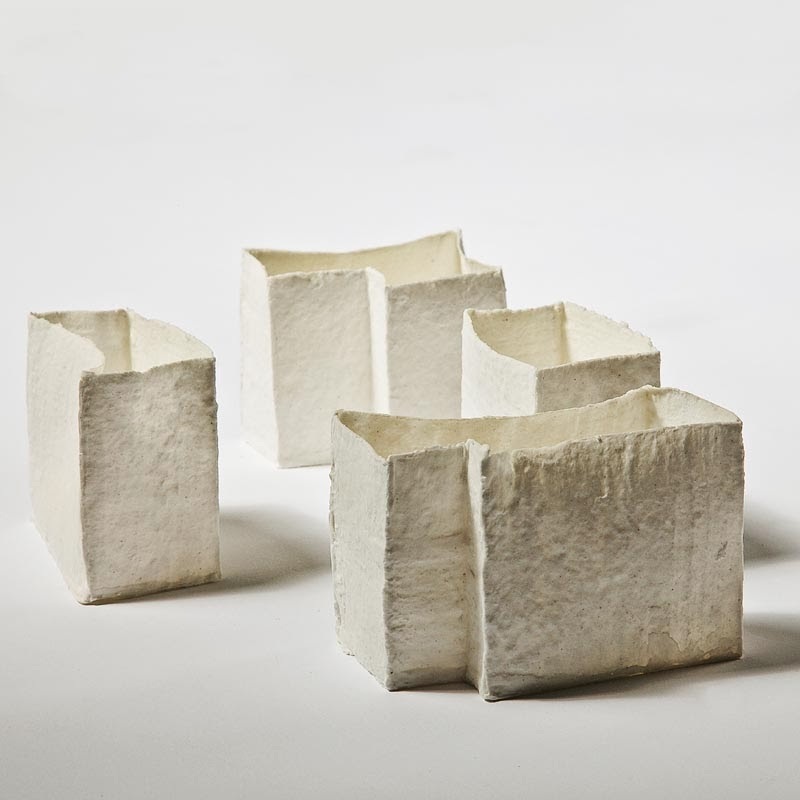 Mette Marie Ørsted's exceptional sensitivity to clay is known in her sensuous ceramic bowls, pitchers, vases and much more. 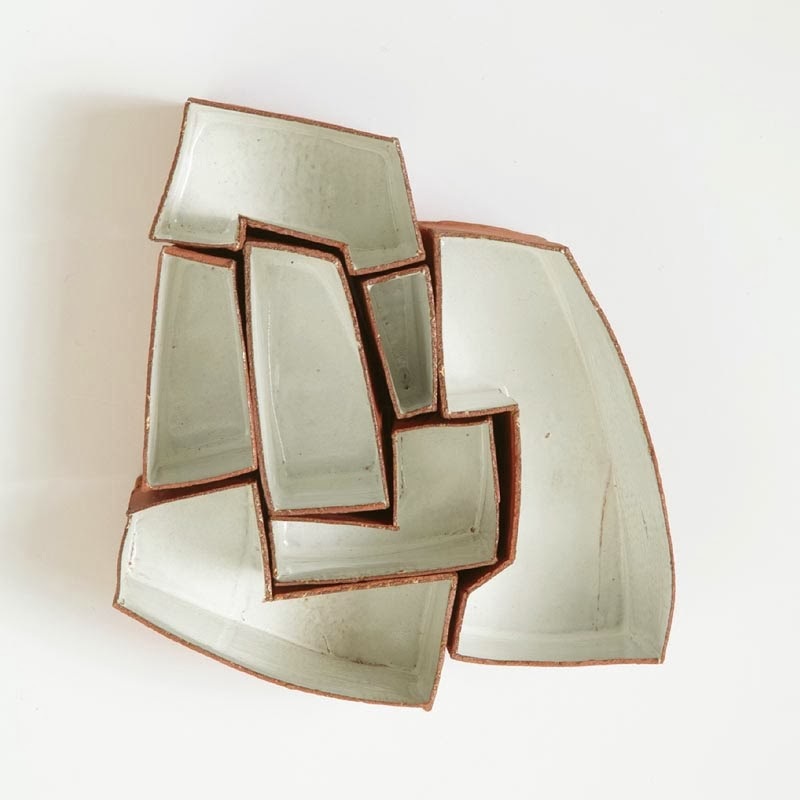 Holding her rustic dishes in the hands almost feels like a warm handshake, but it does not imply the absence of formal consideration. 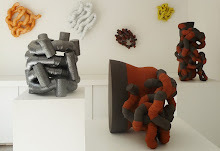 And on rare occasions, she engages in pure form experiments, as is the case for this exhibition. 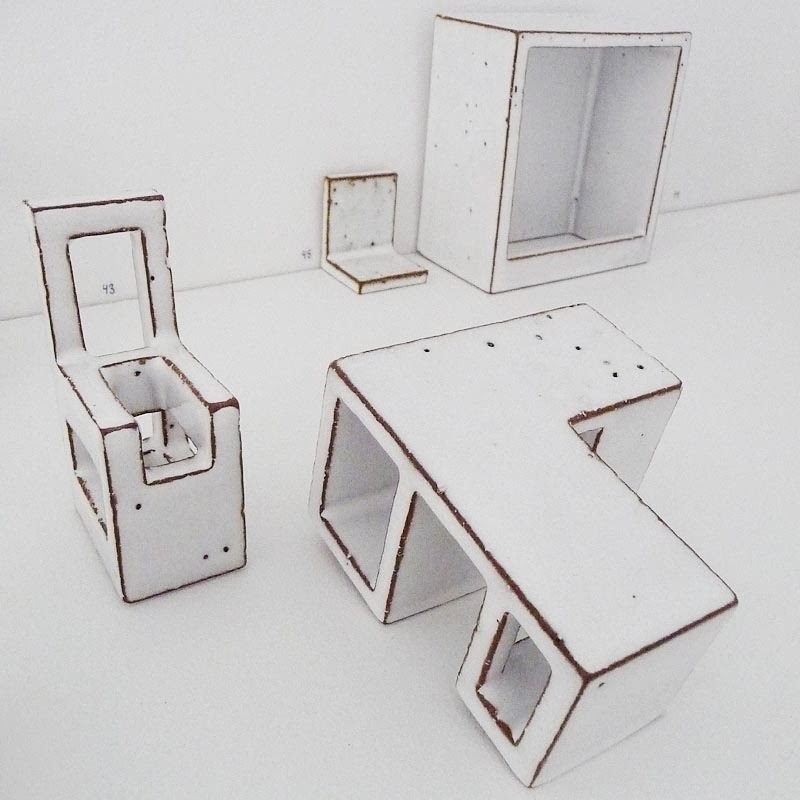 The project has been a long time coming. 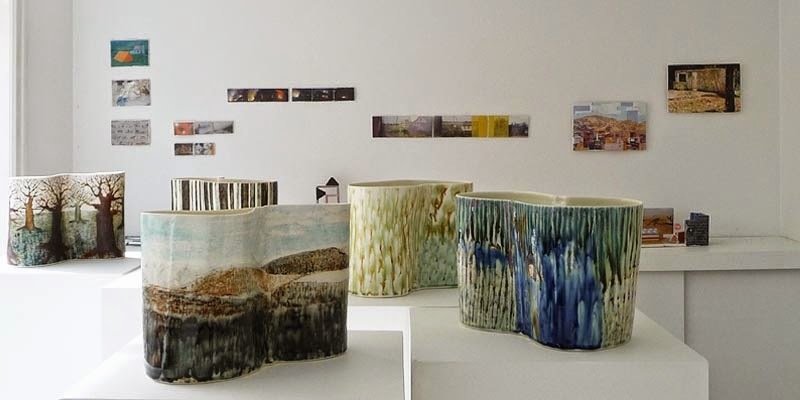 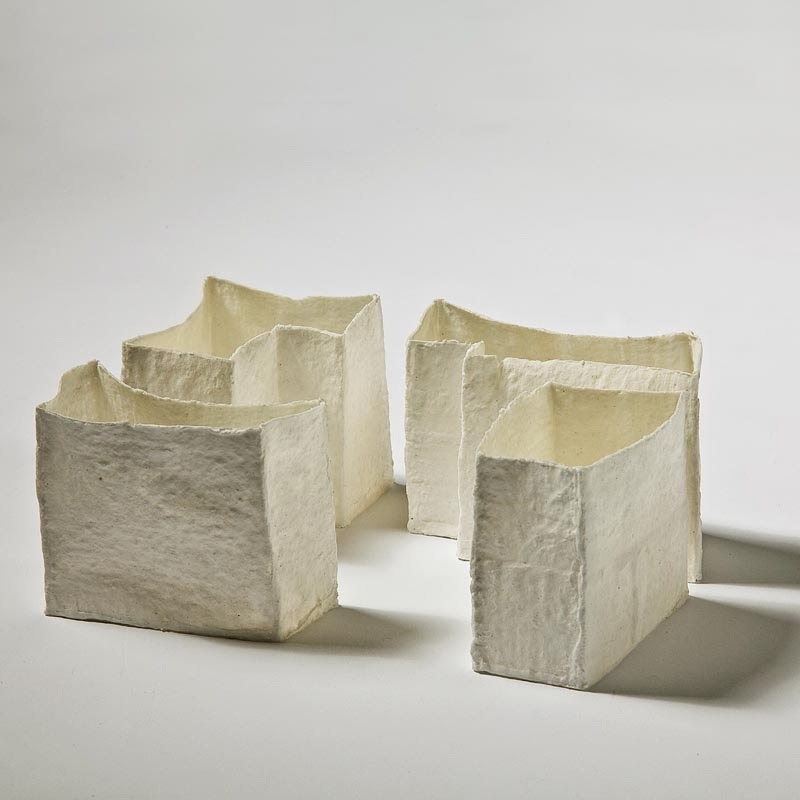 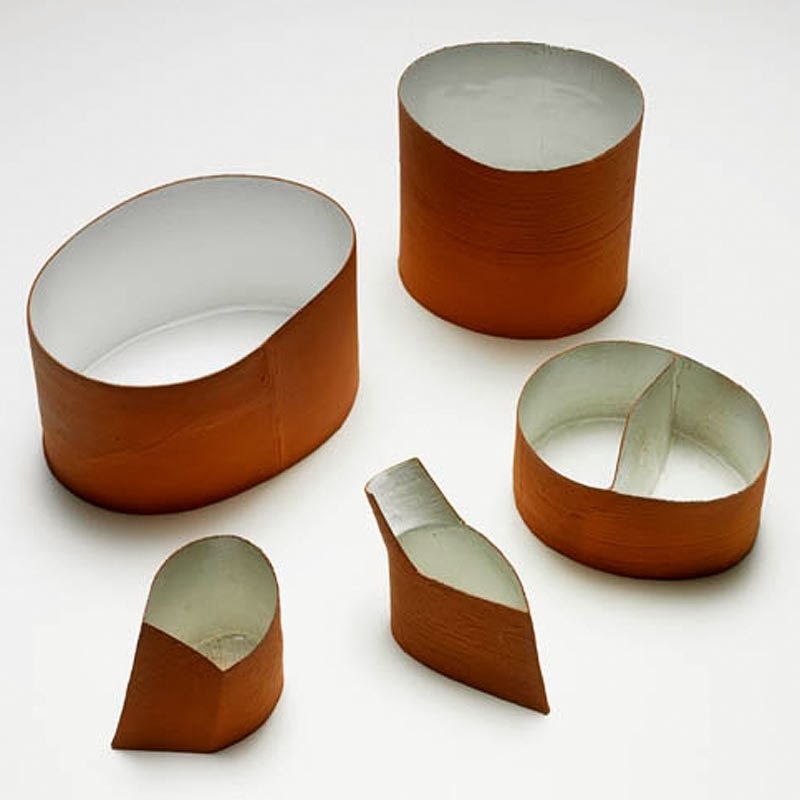 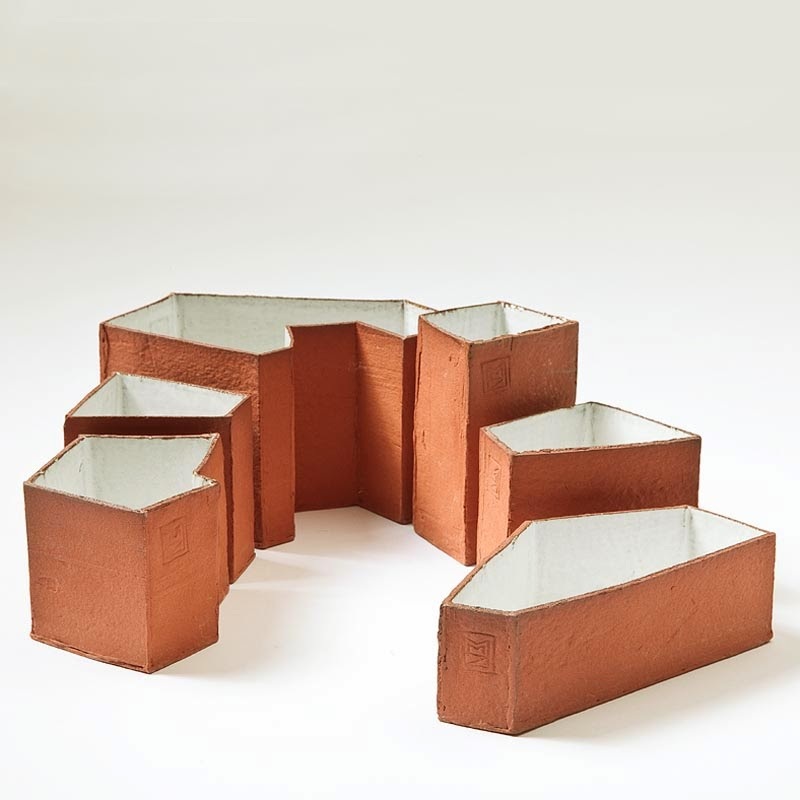 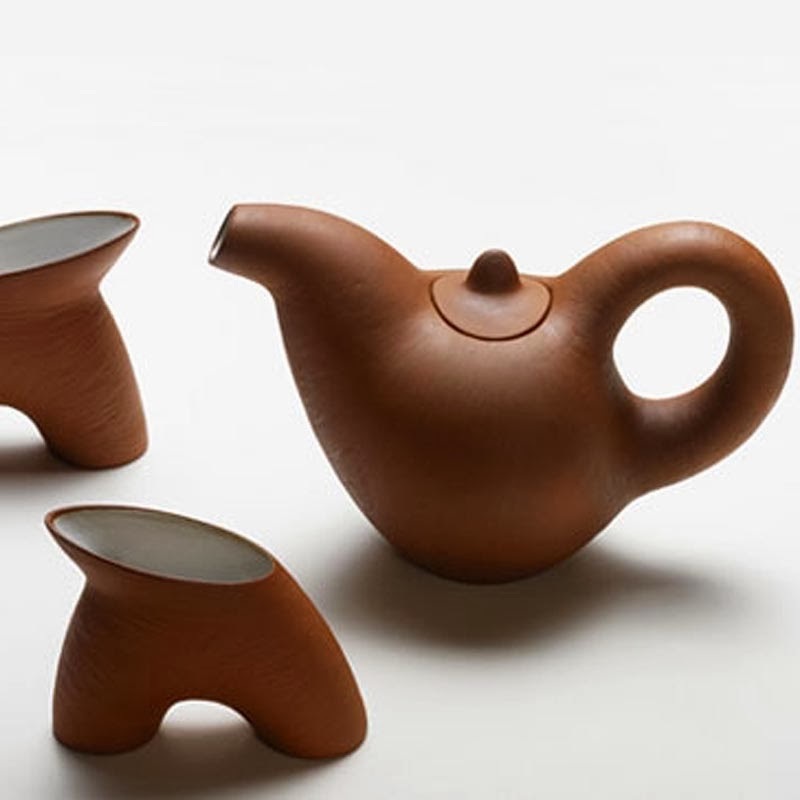 In 2004, she created three small, brittle vase - assemblies that now are exhibited for the first time: One in 6 parts of Bedouin tent fabric - thin bone china with fibre material, and one in 7 parts of high-fired red clay on the outer surface appearing as dusty walls, while the inside has tin-glazed walls. 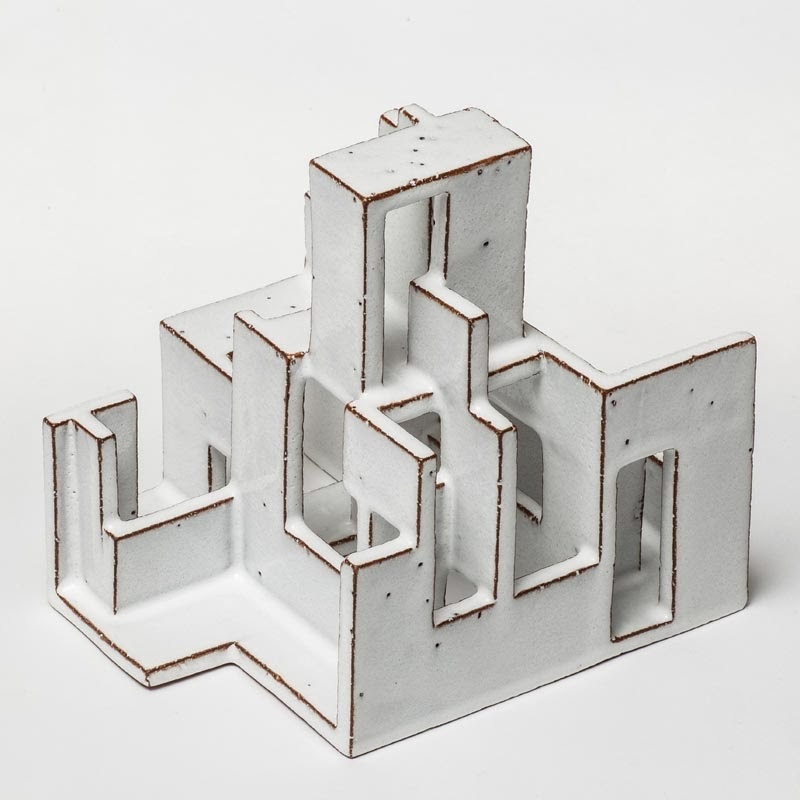 Placed with space between the parts, as it is intended, a labyrinth of mazes of narrow alleys and empty streets occurs, that gives the whole piece a character like a desert-city. 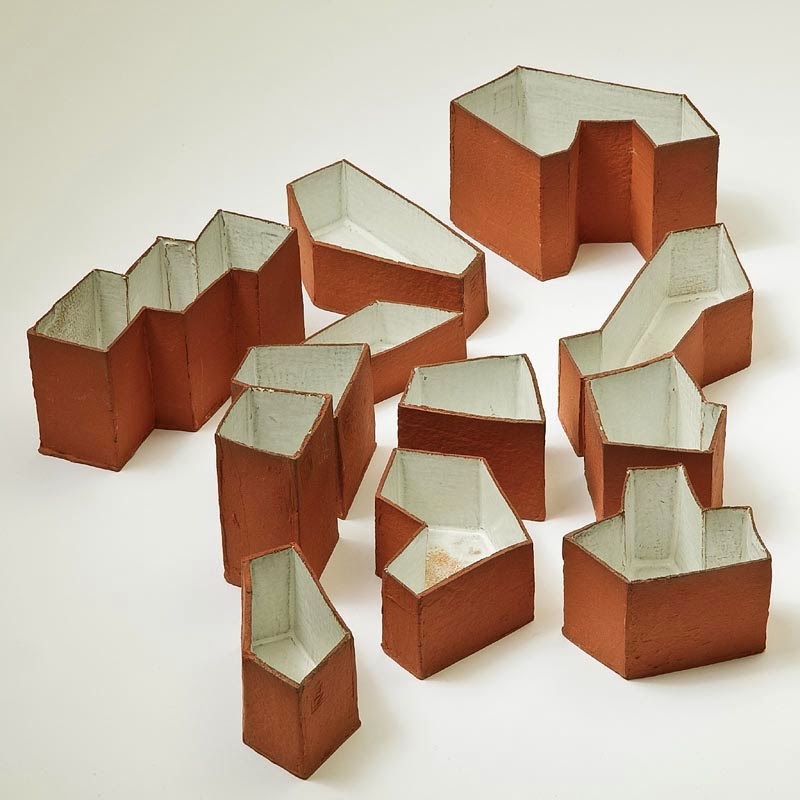 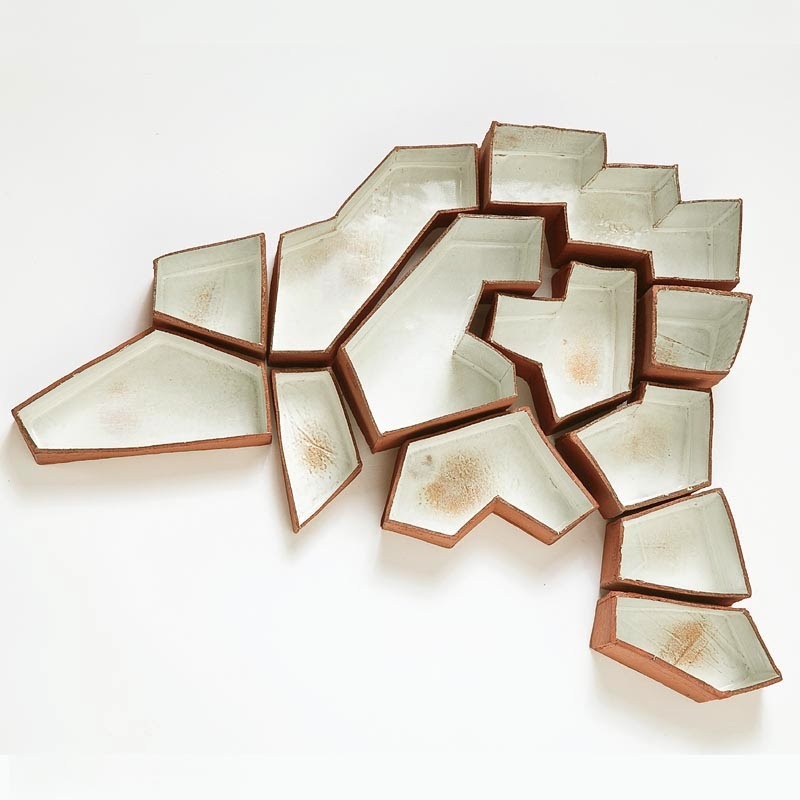 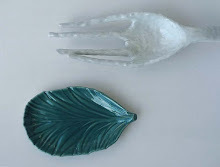 In 2010, for the exhibition 'The world on a plate' at Gammelgaard Culture Centre in Herlev, she created dishes with tin-glazed card houses resting on a plate. 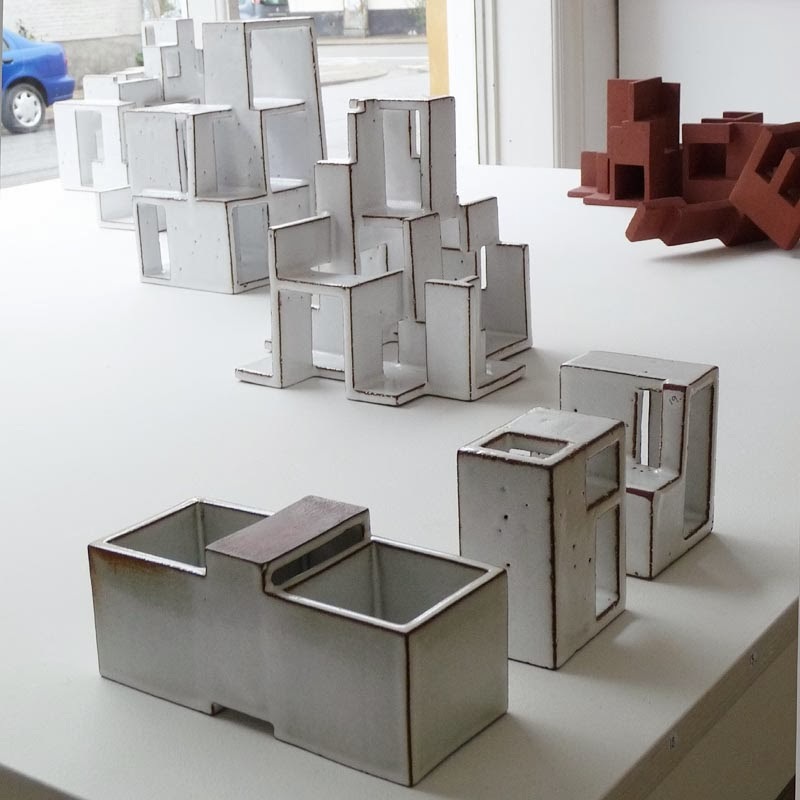 It is of these fantasy cities and imaginary houses that this exhibition of new artworks originates from. 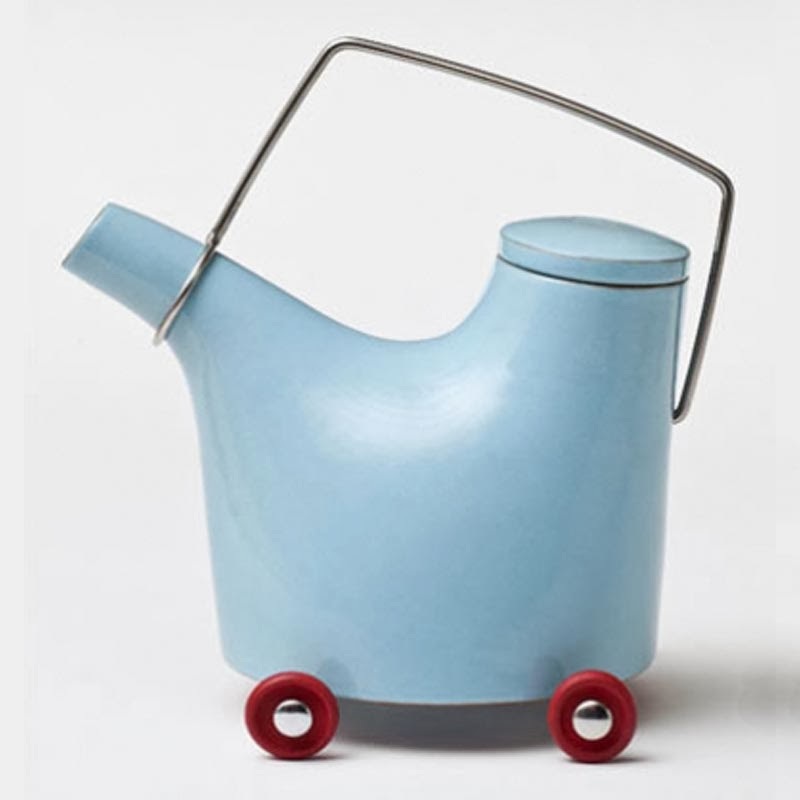 As a novelty, it is a modernist, neo-plasticism or constructivism aesthetic that now exists. 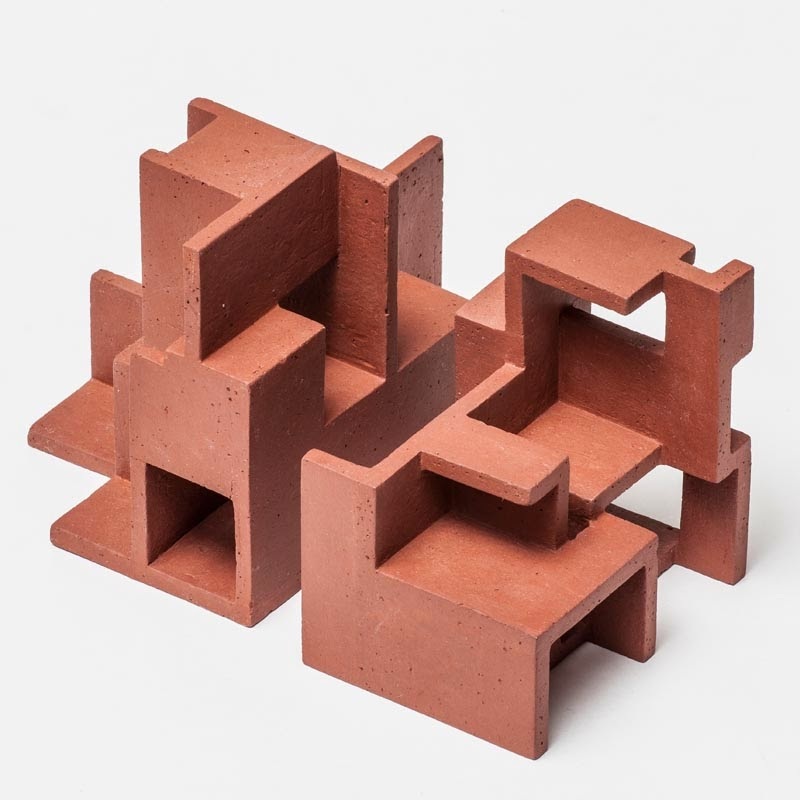 With their right angles they remind us of utopian architectural models, but when it comes to it, they are not models, nor houses. 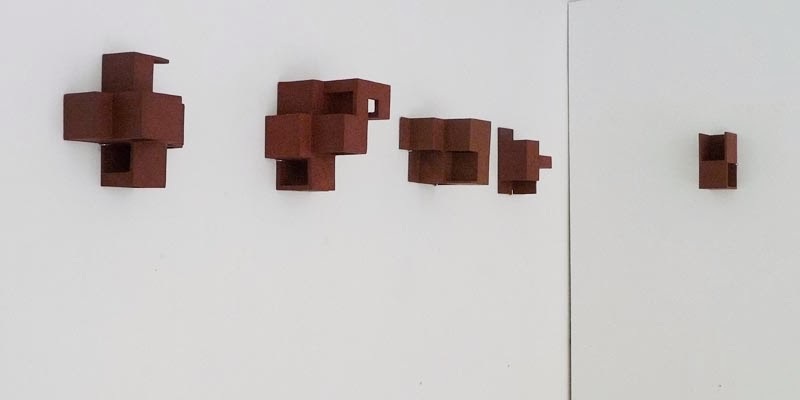 They are spatial structures that only occasionally meet a tight modernist requirement for vertical and horizontal. 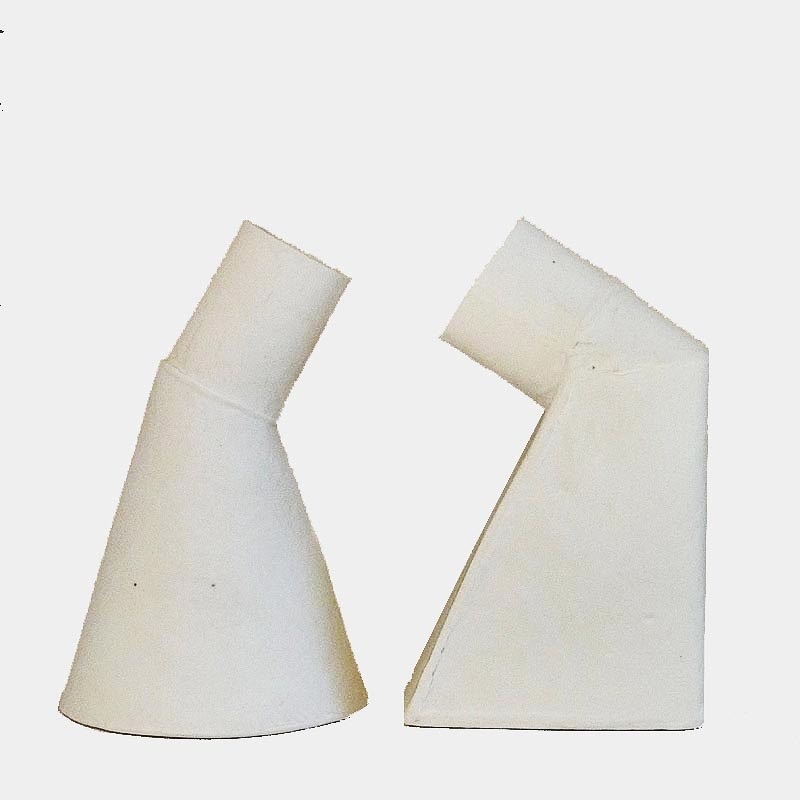 Equally often they challenge the logic, structure, balance and harmony by standing upside-down, hanging or sitting at an angle. 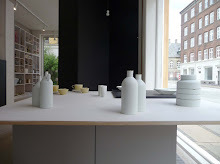 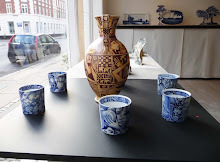 The pieces for the exhibition are an exciting formation study, the results of which may well prove to be included in the foundation of Mette Marie's future work - amongst other things, the vases, jugs and dishes. 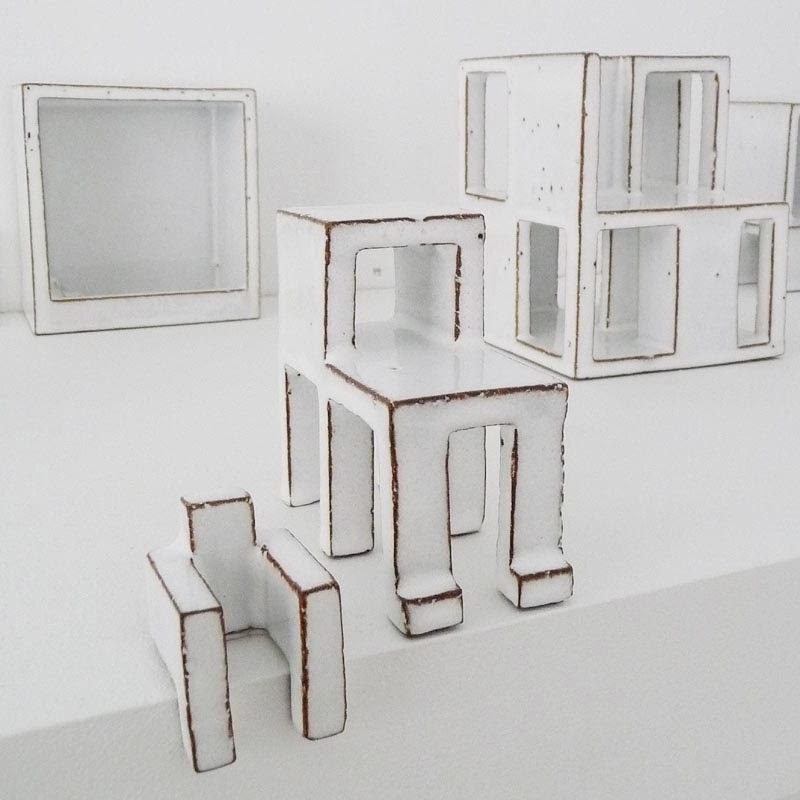 "In the works I have examined the contrast between seemingly random and highly controlled structures. 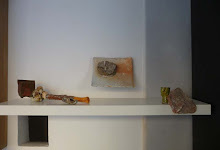 This happened both on an artistic level and in the practical work with the material. 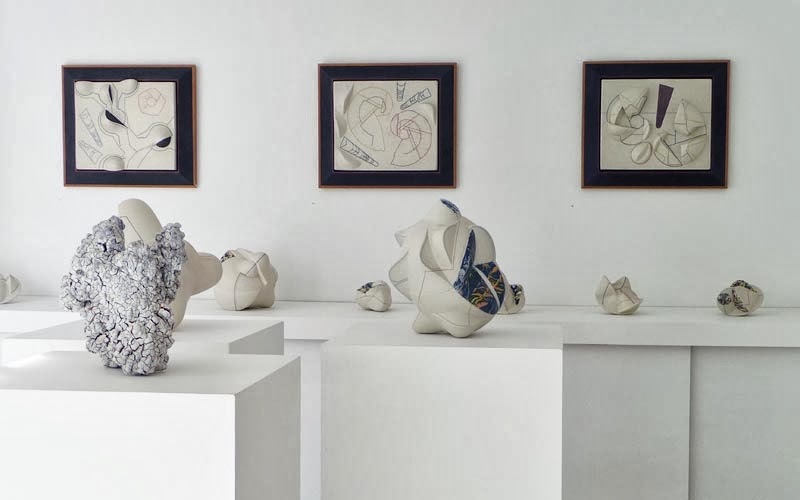 The work is to be shown as if it had partially constructed itself in a dynamic field between self-organized organic and geometric design. 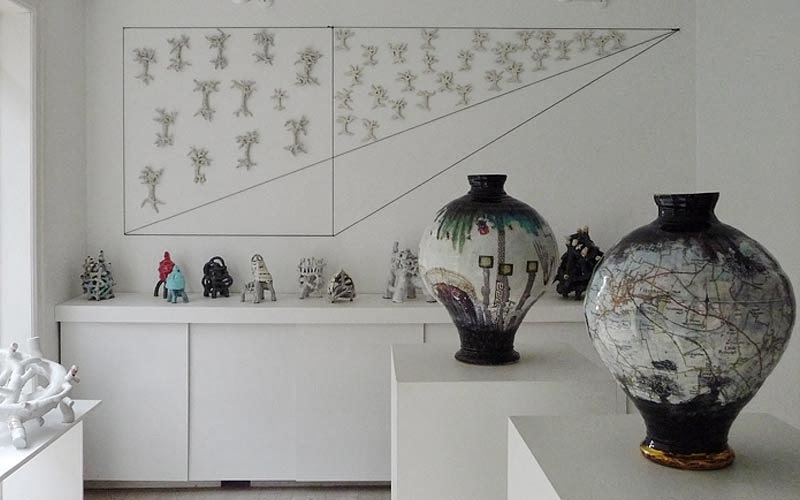 They are inspired by my own sketch drawings that in their line is similar to the city and landscape maps. 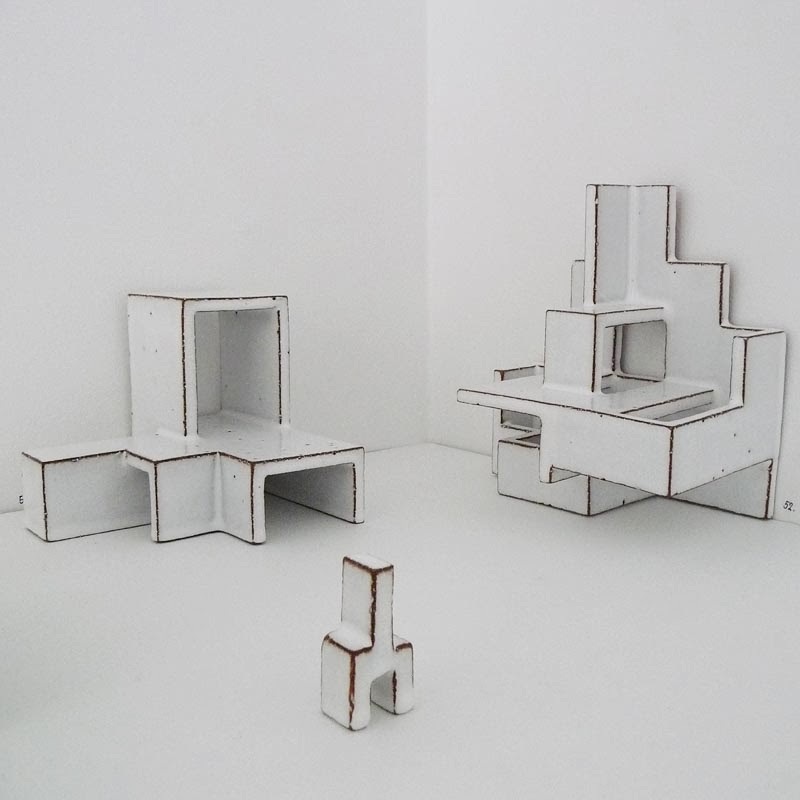 The lines rise from the flat to the space and become three-dimensional models. 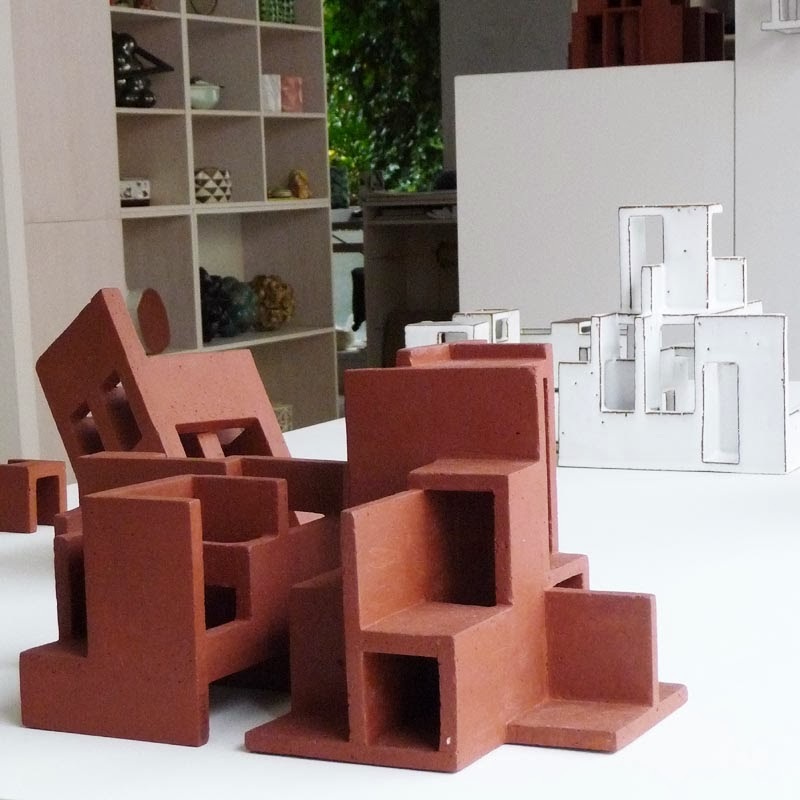 Thereby they also reference to mud-architecture in the Arab countries. 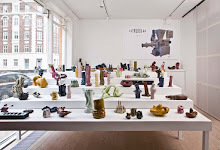 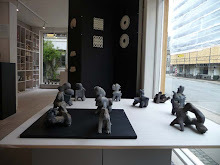 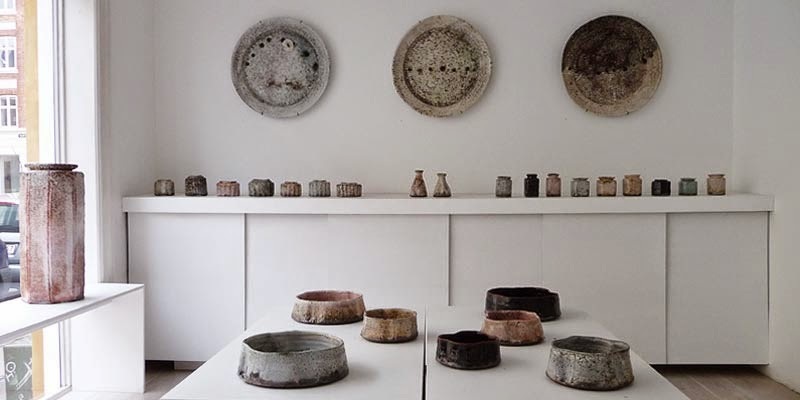 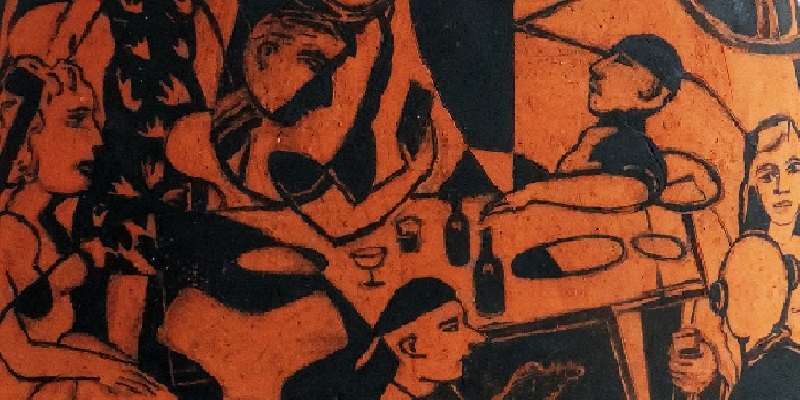 In recent years, I have concentrated on the forming and construction techniques in high-fired red clay and earthenware, shown at the exhibition 'The World on a plate'. 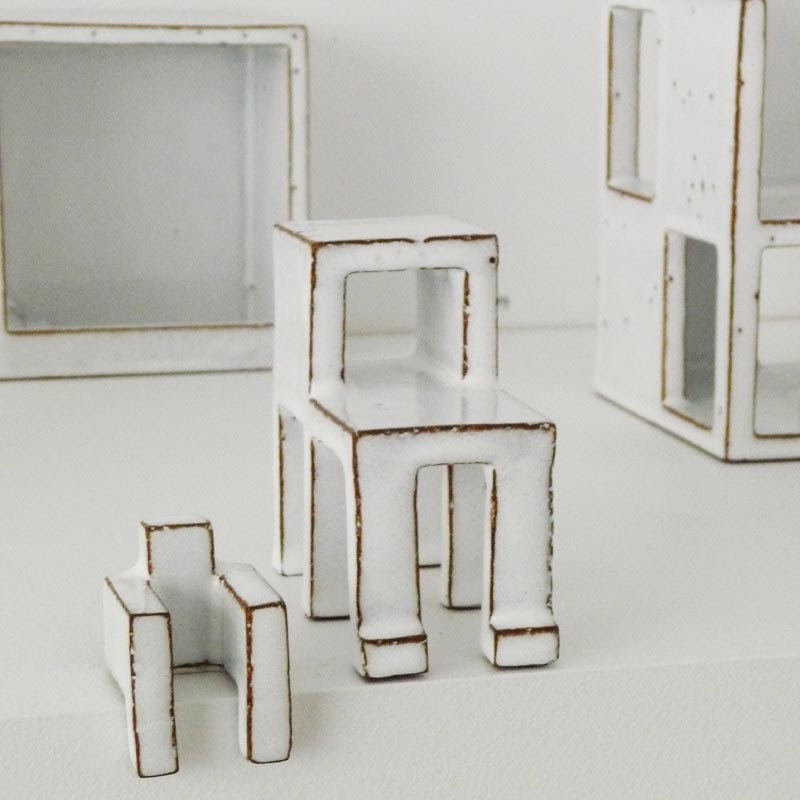 This project builds on these techniques. 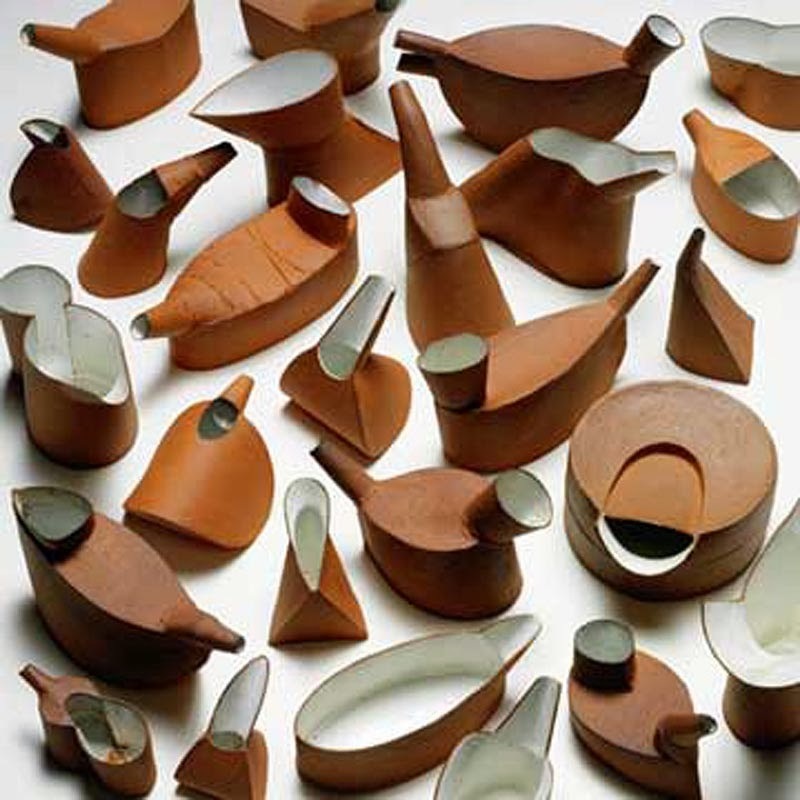 I examine the clay structural tensions: - Can it in the work-flow be compressed or deployed depending on particular techniques and the use of in-blending materials that I have found? " 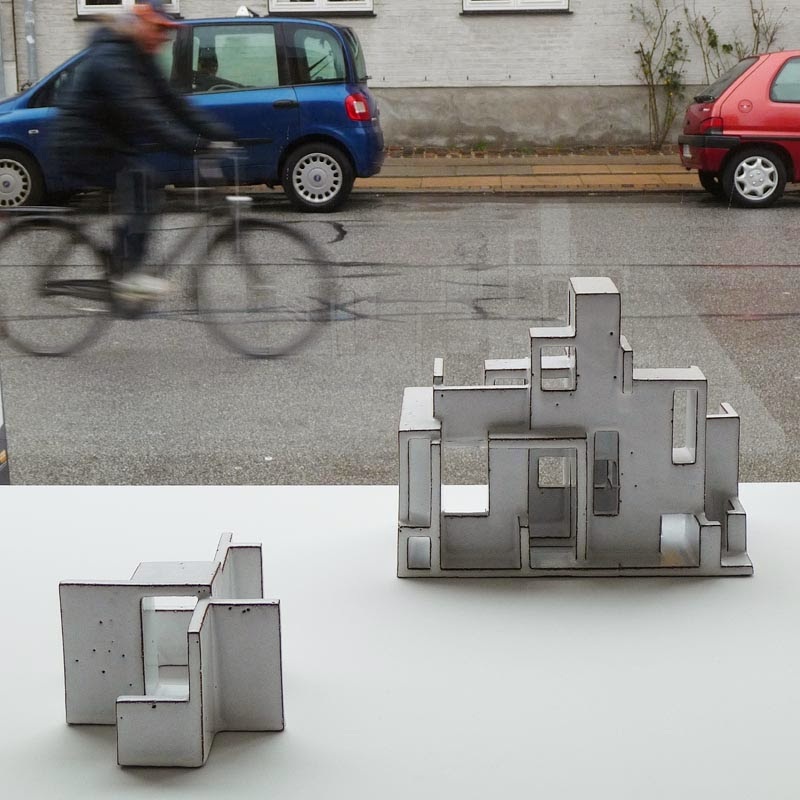 Grateful thanks to the Danish National Bank Anniversary Foundation of 1968 for the generous support of Ann Linnemann Gallery exhibition program of 2013. 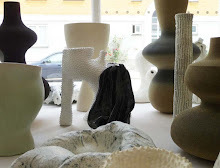 Mette Marie Ørsted was educated at the School of Arts&Crafts (now: Danish Academy Design School) 1973-1977. 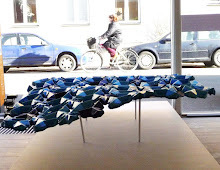 She has had several solo exhibitions and participated in group and juried exhibitions, including the Biennial for Crafts and Design on Traphøj Art Museum and Kolding Castle in 2007 and The Design Museum Denmark 2002, and received Grants from the Danish Arts Foundation, including a Work Grant in 2011.